The debate on auto negotiation is still on. I have faced the lot of outages because of auto negotiation. Sometimes you find that the working link with auto negotiation configured come up with half duplex consequences packet drops which may lead to the various outages. According to the IEEE 802.3u clause number 28, 802.3z clause number 37 standards the auto negotiation should be enabled on devices. This is optional but always recommended. The best is to read the SUN’s Ethernet Auto Negotiation Best Practises. If we are facing problems by enabling auto negotiation, In that case we need to talk to the vendors rather than disabling it. One port is up and another port is down, the issue seems to be weird one but it happens when the two switches are connected over fiber. This happens because one side of the switch is not receiving the signal. In the given diagram, see the connectivity of the ports. The failure of one fiber because of any reason make that port down. The port which is receiving the signal is showing up and the port which is not receiving the signal is showing down. This type of problem leads to the spanning tree loop in the metro ethernet or ring topology. 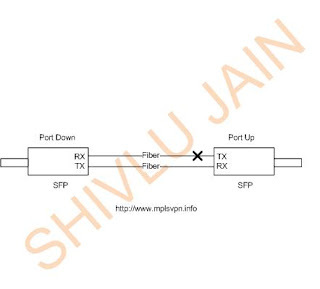 To overcome this problem, UDLD (Uni Direction Link Detection) is required. This protocol forces the both end ports to make down. 1. Open Standard and can be used by anybody in the world without any charge. 3. Releiable and Efficient to transfer the data from single host to another host. In 1950, United States Department of Defence (DoD) formed Advanced Research Project Agency under the guidance of the RAND Corportaion.ARPAnet aka ARPA Network was launched in 1969 by ARPA due to the potential threat of nuclear attack from the Soviet Union. The primary objective of ARPA to design such a robust network which would help United States Military forces to stay in touch during any case of disasters or war. During that time, communication generally happened among the systems with the Network Control Protocol which had many limitations of communication. Due to the communication restrictions, NCP could not be deployed at larger scale. The main disadvantage of using NCP was that communication was restricted only with in few computers. But ARPA needed such language which could be used by any type of computer, any where in the world, robust by nature and easily fulfill all the requirements of mulitary forces. 1. No single point of failure. 3. Easily reroute the data in case of failure of one link. 4. Ability to connect different types of computers over any type of network. To fulfill all the requirements and overcome the constraints of NCP, Transmission Control Protocol had given birth by Vint Cerf and Bob Kahn in 1974. This TCP was suite of protocols which eventually replaced NCP. By 1978, a new suite of protocols called TCP/IP came into existence and In 1982, finally it was decided by ARPAnet to replace NCP with TCP/IP. On January 1, 1983, ARPAnet migrated to TCP/IP. The full migration story from NCP to TCP is being described by RFC 801.